I’m a muffin lover, are you? Remember the low-calorie blueberry muffins that I found from Zen Bakery? Those are super good! But let’s be honest, what is your favorite part of the muffin? Why, the top, of course – am I right? If so, then you’ll really appreciate VitaTop’s Muffin Tops! I just tried the Triple Chocolate Chunk VitaTops and I must say – yum! These are made using natural ingredients including real cocoa, organic sugar, whole wheat, and real chocolate chips – including white chocolate, milk chocolate, and just plain ‘ole glorious chocolate. They are amply sized and just 100 calories for the entire muffin top – with just 1 ½ fat grams and four grams of protein, nine grams of fiber (4 weight watchers point plus points). Delish! The fun doesn’t have to stop there, however. 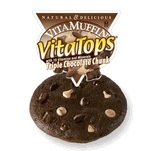 There are other indulgent flavors of VitaTops muffin tops to enjoy, including Apple Crumb, Fudgy Peanut Butter Chip, Deep Chocolate, Chocolate Mint, Raisin Bran, Banana Nut, Golden Corn, Banana Fudge, Dark Chocolate Pomegranate, Blueberry Bran, Cranberry Bran, Sugar-Free Banana Nut, and Sugar-Free Velvety Chocolate. With flavors like those, I sometimes think about them as a cupcake, rather than just a muffin. What really sets these treats apart is the fact that they are so good for you. They are loaded with vitamins, thus the name, VitaTops, including Vitamins A, C, D, B6 and B12, as well as calcium, thiamin, riboflavin, niacin, folic acid, biotin, and zinc. They are also low in sodium, free from cholesterol, and have no nasty trans-fats. These are the perfect take along snack or lunch bag filler for anyone on a diet or for anyone who is looking to eat better and healthier. Enjoy these with a serving of cold almond milk and your taste buds will be in heaven. Finding vitatops is not always easy. Look for them at regular and specialty grocery stores in the frozen or breakfast section. You can also buy them online on Amazon.